Mangore | Bellucci Guitars - Whitney Houston, "I Will Always Love You"
Renato Bellucci Teaches Whitney Houston (Dolly Parton's) "I Will Always Love You" from the movie "The Bodyguard". To play the Classical Guitar is to be able to grasp, extract and offer the essence of a music using a very unique and beautiful language. The Classical guitar possesses a very sophisticated and exuberant technique which allows it to be able to perform in all musical styles. This is the reason why most of the great guitar repertoire is made of transcriptions and or adaptations from other instruments. This is at the core of the classical guitar. The same is not the case with Flamenco, Rock and Pop guitar. When transcribing songs, the main challenge is always to keep the main melody in centerstage especially when the melody is so well known that every note in the melodic line s so to say "expected" by your audience. I Marked the main melody in blue but decided to keep the writing in arpeggio style because it represents graphically better what the performer must achieve. To play the Classical Guitar is to be able to grasp, extract and offer the essence of a music using a very unique and beautiful language. 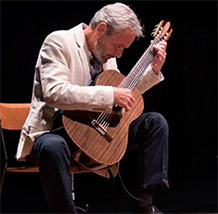 The Classical guitar possesses a very sophisticated and exuberant technique which allows it to be able to perform in all musical styles. This is the reason why most of the great guitar repertoire is made of transcriptions and or adaptations from other instruments. This is at the core of the classical guitar. The same is not the case with Flamenco, Rock and Pop guitar.When transcribing songs, the main challenge is always to keep the main melody in centerstage especially when the melody is so well known that every note in the melodic line s so to say "expected" by your audience. I Marked the main melody in blue but decided to keep the writing in arpeggio style because it represents graphically better what the performer must achieve. Below I inserted a small animation to show the main technique to be used in "I Will Always Love You" which is LEVERS. These help keep the left hand in placing the fingers on teh fingerbard with greater ease and control. Renato Bellucci plays "I Will Always Love You"
San Bernardino, Paraguay, December 13 & 14, 2014 - S.D.G.